I acquired some pieces of Connecticut skate & BMX history several years ago; 2 molded fiberglass transitions from one of the first ever CT skateparks...which is long, long gone! 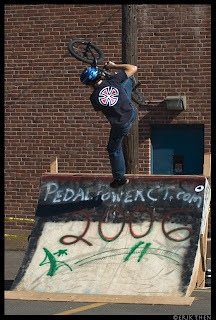 These ramps have been passed around for years and were set-up at Cutting Edge for a long time before I got my hands on them for the Pedal Power Stunt Shows we used to do. Long story longer, the ramps have been sitting in Krol's backyard for a few years and they will soon find their final resting place in the driveway of 122...where the TNT Trails are. I plan on placing the trannies side by side to make a 16' quarter in the driveway. A nice big 4' deck, a clean paint job, and maybe a sub-box and/or wallride down the road and these pieces of history will be action!